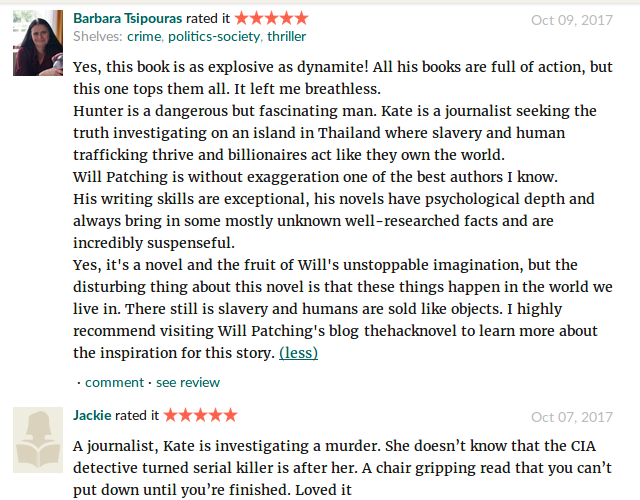 Journalist Kate O’Sullivan investigates the murder of two young Brits on a paradise island – unaware The Hunter, a renegade CIA agent turned serial killer, is obsessed with her. Can Kate survive the attentions of these predators? This thrilling second instalment in The Hack Trilogy can be read as a stand alone tale, but why not grab the riveting rapid-fire first volume, The Hack? Available from all good online retailers. This series of gritty, fast-paced international crime thrillers features ex-CIA operative 'The Hunter' and the woman he desires, investigative journalist Kate O'Sullivan. Chief Lee, an incorruptible and relentless investigator with the Royal Thai Police, also plays a large part in both of the first two novels. When a young British couple are brutally murdered on a beach on a holiday island in Thailand, Kate O’Sullivan is sent to investigate for The Crusader newspaper. Two Burmese fishermen have been charged with the crime, but the victims’ parents believe there has been a cover up, and Kate soon learns that all is not as it seems in paradise. Inspired by actual events - use this link to find out more. Contains 'hard-hitting realism' that some readers may find disturbing. This second novel in The Hack Trilogy of fast paced international crime adventures will take you on a rollercoaster journey deep into the dark heart of ‘peak capitalism’ and the vile trade in human flesh and blood. Along the way you'll encounter Machiavellian billionaire slave traders, an intriguing murder mystery, an international conspiracy, and a ruthless Arab prince and his entourage - along with our intrepid heroes who find themselves in grave peril. Out now grab your copy today! This short video from the UK's Guardian newspaper was partly filmed in Ranong, Thailand, where my own charter yacht was constructed in 2007/8 (she sank in 2012 but that's a whole other story!) and describes the appalling phenomenon of modern day slavery and people trafficking - something I have observed first hand. The accompanying article and similar stories on human trafficking and modern slavery can be found here . You will also find some further information on the inspiration for the story here. If you have any queries by all means drop me a note through my Facebook Page, or if you'd prefer a personal response then please email me or use the contact page. And finally, if you have not yet read book one in this rapid-fire trilogy, then why not? ​Amazon UK, Amazon US, Apple, Nook & Kobo.